1. Click Find Past Verifications, located in the menu at the right of your screen. 2. Enter the Email and either the Verification Services Order ID OR the Transaction ID (do not enter both). 3. Select All under Status. 4. Type in the date range under Date Requested (using the MM/DD/YYYY format). You can also click on the calendar icon to find/select the dates. Click the “Show Details” link to expand any order, revealing the details of the verification. For confirmed verifications marked with the green ribbon icon, click the “Certificate” link to open, save, and/or print the certificate. For professional certifications, you must print the current screen. If a request has a icon, this means it was unable to be confirmed. If you see the icon, your request is still “Pending” (either awaiting faxed consent or school research). To learn more about verification status types, see the topic, Didn’t Get Instant Verification. At any time, Clearinghouse account holders have the ability to generate dynamic reports on transactions and billing for a desired time period. You can also export the detailed report to Excel or PDF to print for a presentation or reconcile with your company’s financial accounts. You must enable pop-up windows to view reports. 1. Click the Reports option under the right menu. 2. 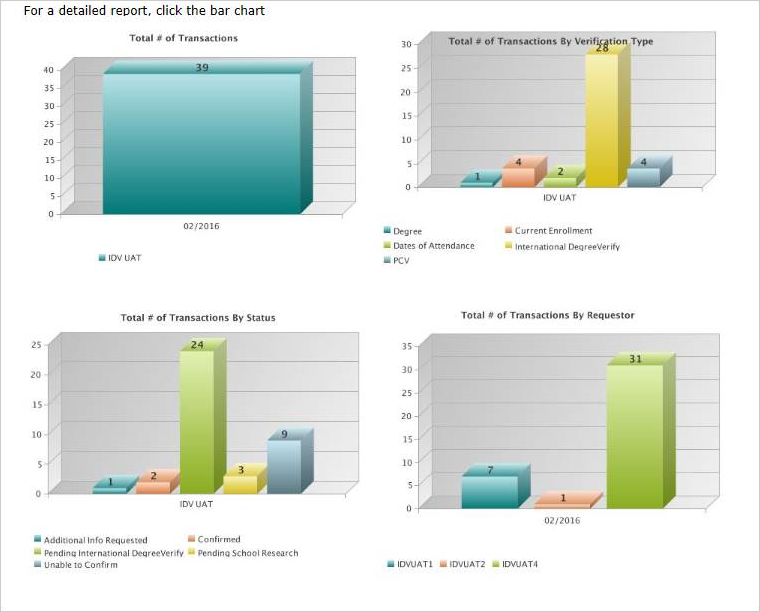 Select the type of report from the dropdown menu: Transaction or Billing. 3. Type in the specified begin and end dates, using the MM/DD/YYYY format. Or you can click on the calendar icon to select from the calendar (you can query up to 12 months at a given time). 4. Click Go. The custom report will pop up in a new window. 5. Click on any of the colored bars in the graph to see the detailed spreadsheet. 6. To export as a PDF or Excel file, click Export. 8. Enter the File Name and click OK. Note: You must enable pop-up windows. If you generate a billing report, you will also see the total amount billed (including applicable sales tax). Guest and registered users do not have access to the Reports feature of Verification Services; it is available to Clearinghouse account holders only. 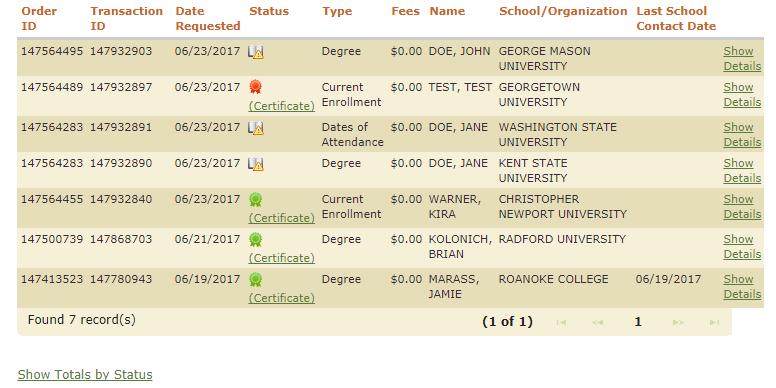 You can see your order history for any academic verifications performed during the current online session.